The Seattle/King County Coalition on Homelessness conducts an annual “One Night Count,” which includes a street count in portions of Seattle, Bellevue, Kirkland, Redmond, Shoreline, Kenmore, Bothell, Woodinville, Kent, Federal Way, Renton, Auburn, and White Center and a survey of homeless shelters and transitional programs throughout King County. The 2012 “One Night Count” identified the following trends. 8,830 individuals were counted on the January 27, 2012 One Night Count homeless street count and survey data. Of these individuals, 6,236 people were found in shelters and transitional programs. 2,594 people were surviving outside without shelter. There are more homeless individuals or families throughout Seattle and King County who were not counted on the night of the count either because they were hidden from volunteer counters, are living unsheltered in areas of the county not included in the count, or are temporarily homeless but staying with friends and family. Around a third are young parents (age 25 or under) and half of these are very young parents (18-21). About half of the children are not yet school age (under age 6). Persons of color are over-represented relative to the general population and those in poverty (64%). 70% are not currently employed. Most families (69%) are homeless for the first time. Most families (57%) are doubled-up (staying or living with a friend or family member). Fully 85% of families want employment and education services. Families are experiencing a housing and economic crisis; 93% have income below 30% of AMI. Most families have low housing barriers and many strengths including positive work history (53%), no evictions (67%) and low or no criminal history (86%). 685 youth and young adults ages 13 to 25 who were homeless or unstably housed. Of these, 408 were staying in shelter or transitional housing programs. 277 youth and young adults were surveyed at program sites and other places that homeless youth frequent. Many of these youth ‘couch surf’ with friends and relatives and so represent a hidden aspect of homelessness. 62% were people of color. The youth and young adults counted by the survey differed from those in shelter or transitional housing. A higher percentage of survey youth were minors, male and African American, Asian or multiracial and from South Seattle or South King County. General Demographic information from Safe Harbors HMIS on people accessing shelter indicate that shelter residents are predominantly male and a disproportionate number of people of color. More than one-third of clients stayed less than 7 days over a 12 month reporting period and there are differences in the populations served in Seattle and in the County. Important caveats: People may be homeless and not access services or access services not enrolled in Safe Harbors, and the demographics of shelter residents may be a reflection of the type of shelter programs available and who they attract. Among those staying 8-59 days: Seattle client profile -- majority are men, 31-50 years old, people of color, disabled, and 21% are veterans. King County client profile -- majority are younger men, not disabled, and 11% are veterans. Among those staying 180+ days: Seattle client profile -- majority are men, 51 or older, disabled, 23% are veterans. King County client profile -- similar to above, although more are disabled and the number of older men increased somewhat. The Community Information Line/211 reports that nearly 50% of all calls received are housing related. Requests for utility assistance and food also increased. The largest number of calls comes from South King County, followed by Seattle. 45% of all renter households in King County pay more than 30% of their income for rent. Less than 5% of apartments in King County are affordable to households earning less than 30% of median income ($26,400 for a family of four). King County has a 4% vacancy rate, and the average rent for a two-bedroom apartment in King County is $1,069[vii]. A worker must earn over $20 per hour to afford this housing (housing is considered affordable when it costs 30% of one’s income). 1811 Eastlake, a program of the Downtown Emergency Service Center (DESC), provides supportive housing for 75 formerly homeless men and women living with chronic alcohol addiction. In the year after residency, residents reduced their visits to the emergency room, sobering center and jail, resulting in cost savings of more than $4 million. The 40 people who were the highest users of Harborview and the Sobering Center cost $2,000,000 annually until they got them into housing at 1811 Eastlake. Client Care Coordination (CCC) assesses and identifies individuals who are the most frequent users of emergency response services or who are highly vulnerable and currently on the streets. The goal is to enroll them in housing and reduce costly emergency services. Preliminary analysis completed in 2011 compared system usage six months prior to housing placement and six months post housing placement for 117 high utilizer tenants placed through CCC. 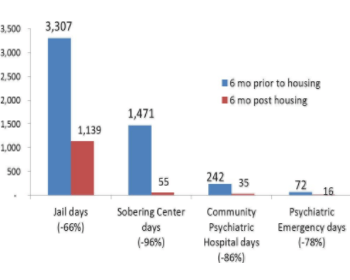 Results showed significant reductions in the use of the jail, the sobering center, community psychiat¬ric hospitals and psychiatric emergency services, as shown in the adjacent chart. A mentally ill prisoner in the King County Jail (over half of whom are homeless) stays almost 140 days longer than a general population prisoner, at an estimated cost of $300 per night. In fact, the King County Jail is the second largest mental institution in the State of Washington.